Autodesk freelance illustration, using Autodesk Ink app on tablet. About: The underside of the city shows a different palette of conversations, running counter to all that rigidity, all those grid lines. Autodesk freelance illustration, using Autodesk Ink app on tablet. About: In the mirror, she has to think twice about the subversion of the object into Subject. An area concept piece for Cindering, an adventure game. My original IP. The last three and a half months for me has really been a time of rapid discovery for me, in terms of my own personal energy, my ability to visualize and imagine, and to see new positively humanistic qualities in me that I had not known before. I am referring to the environment in which I had started to develop a whole skillset around game arts and design, which is my current post-grad education. It’s so exciting to look back upon because, within that little time, I had started from no formal training whatsoever in visual arts to feeling familiar with the qualities of being a 3D environmental artist. Indeed, I am able to hone down to say that environmental or inorganic art assets in digital 3D is specifically what I’m most excited about. Through the encouragement of some really talented classmates, I have also dabbled in understanding more about character design and concept art. Before I get too verbose, let me tell this of my fourteen weeks of projects and assignments starting with week 14, then jumping back to week 1 and telling everything else chronologically. It’s humbling that there’s been so many people who’s had a hand in giving me advice and guidance to offer me ways to improve my work at every stage; These confident individuals are my instructors, friends, and peers, who are each unique in their skills, goals, and strengths. …was my claim to fame this semester (I mean that it’s a personal hallmark, as that’s what matters). I did what I thought would’ve been impossible: A solid modular hallway early in the week, using an untested texturing technique; Two pieces of original concept art that I was content with; and having the endurance to pull an all-nighter to get out some solid bakes out of two projects, amongst a lot of other things. I’ll explain below the screen captures. Clockwise from Top Left: 1. Modular Hallway; 2. “Cindering” alchemist lab concept art one; 3. Freedom Fighter Character baked in 3DS Max; 4. Freedom Fighter robotic arm, forearm baked and textured; 5. Warhammer with custom materials and light map in UDK; 6. “Cindering” alchemist lab concept art two. Not shown: Posing of character before final bake. The modular hallway – a lo-fi transportation info hub – really solidified for me how much I love doing texturing and inorganic objects. I haven’t quite wrapped my head around doing the most efficient unwraps for organic objects yet, but I have confidence in my inorganics. But creating meshes from a single 1024×1024 texture sheet is even better. The modular hallway is comprised of that, and completed over two days with little sleep. It’s a project that I will polish off for the portfolio, singing merrily as I complete it. Further, if my concepts for semester two are anything to go by, I seem to have a thing for environments with a touch of modernist future pasts. But I’m getting ahead of myself here. The two concept art pieces of the alchemist lab really came to its own in this last week of classes. By doing these pieces, I feel like I was getting much more comfortable with painting quicker (not quite speed painting yet, but hey!) 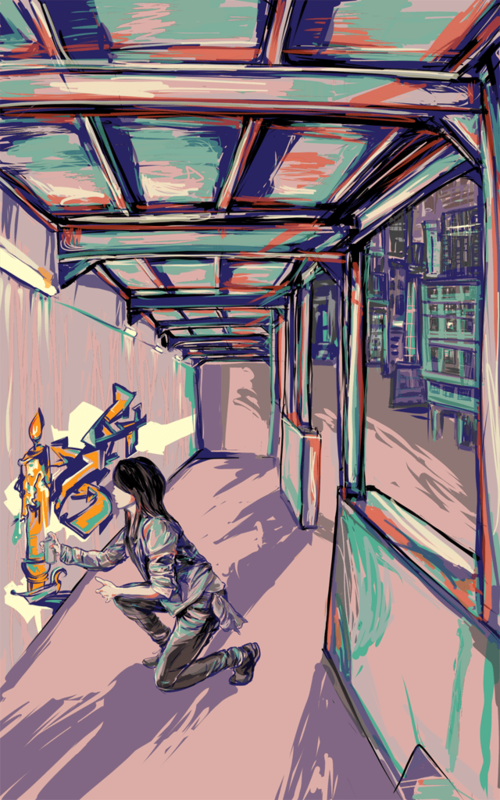 and playing with a lot of layers and colours. Before, my digital art had looked dull in comparison to my pencil crayon pieces, but by learning how to use brushes and layers with blending modes makes a significant difference. As does using a lot (a lot, a lot) of references. For a presentation, it seemed to work well for the art piece with the plane in it that not all of the asset pieces are to scale, but they were emphasized by size as much as they need to be. The warhammer was modelled from scratch starting Week 9, then textured, baked and unwrapped between Week 11 and 12. The modelling was based on a concept drawing from the Warhammer series. I quite enjoyed having a mix of materials that I had to texture and added little ornamentation that was an overlay to the existing normal map from the bake. What is exciting about this project is that it is the first assignment we’ve had to dabble into UDK (2011-09 Beta release) and creating materials, light maps, collision meshes and so forth. It’s so fascinating to see the actual object “come to life” in a realtime environment of what could ostensibly be a game. I wish that we could’ve done more with UDK, earlier, because it looks like quite a beast to master. But maybe that’s biting off more than I can chew, because the real beasts that I had to contend with this week were my bakes for my character and her semi-(in-)organic arm. For both assets, the low-poly looks nothing like the high-poly. For the uninitiated, let me briefly explain what it means by “baking a high poly”. Games, because they have to make real-time calculations and are considered real-time environments, cannot store a very large amount of data the way that pre-rendered 3d media such as film can. For example, a character with 4.9 million polygons will cause a game engine to chug to a halt. Thus, there needs to a low-poly character that is very similar in shape to the high-poly character which the high-poly projects onto, as a texture known as a normal map. For reasons that I won’t get into, I lost the low-poly for my character in zBrush, and my low-poly for my arm is nigh-unusable because of the amount of turbosmooth that I’ve thrown onto the shape. The short answer solution is that I need to retopologize, which basically means that I have to build a completely new mesh like a second skin onto the finished high-poly. Easy answer, long task ahead, at least in 3DS Max. For my zBrush 4.9 mil hi-poly character, I merely just pushed around my existing projection and low-poly until the normal map got less and less errors, and the ones that remained I was able fix in Photoshop. It was the robotic arm that was a horror. All jagged edges and Ngons in the low poly, I buckled down to use the 3DS Max retopo freeform tools. The fingers were nigh impossible with the projection landing in the right place, however. This would be a project I revisit in zBrush instead for the new semester. Although I’m not aiming to become a character modeller in the near future, I have enjoyed the learning experience and thought that the unique set of challenges it posed really gave me an enterprising spirit. I’m intrigued by zBrush and highly aware of how hard it must be to master it. Although I haven’t taken advantage of it, I know how much I must use more subtools to my disposal. I look forward to finding out more as to how I can use zBrush on hard surface modelling instead to give it some unique aging and ornamentation. First week of fun! We hit the ground running with learning the basics of navigating in 3D space. So our first week’s homework is learning to make “snowman” here, by pushing primitives together, most notably spheres. We haven’t even learned editable polys at this point! It totally breaks all the rules of how 3D objects actually work for games, so it’s just an exercise to get us comfortable with 3D spaces. It’s so endearing to take a look at this project again. I also became acquainted with form and silhouette as a result. Our second assignment is texturing a box with unique faces with a diffuse map. We learned how to use various blending modes to help accentuate the look of a wooden crate. We really started amping up the homework assignments for class, starting in with some modelling basics and creating our first in-class dino in organics class. Texturing was particularly accentuated by such intensive technical and artistic lessons, usually intermingled. Although I’m only starting to apply the lessons taught here, we are really being challenged to create some interesting stories and histories on our objects. Although it is not easy to learn and apply, the payoff is quite awesome. The first concept art piece that I’ve done that’s of an imaginary cityscape! Well, unless you count my elementary school doodles. The exciting thing is that my friends saw my progress work in class and gave me advice on how to paint to accentuate the colour and form in the scene. That, to me, is invaluable, and I strive to do the same for my fellow classmates. The shark in question is a zebra shark (though I’ve never textured it as such). Probably the most bewildering thing this week was creating a building block in UT3 Editor that snaps to grid. I wish that the pivot points were more aligned with those in-house static meshes, and the program was less buggy. If that were the case, I would’ve been able to learn a lot from that otherwise for a particular modular hallway down the road. I was a little bit more patient with the 3-way intersection in UT3 Editor, though I still feel no real synergy with the static meshes, not having really been taught how to understand their dimensions in UT3. And of course, I don’t have that kind of modeller’s familiarity with the pieces. 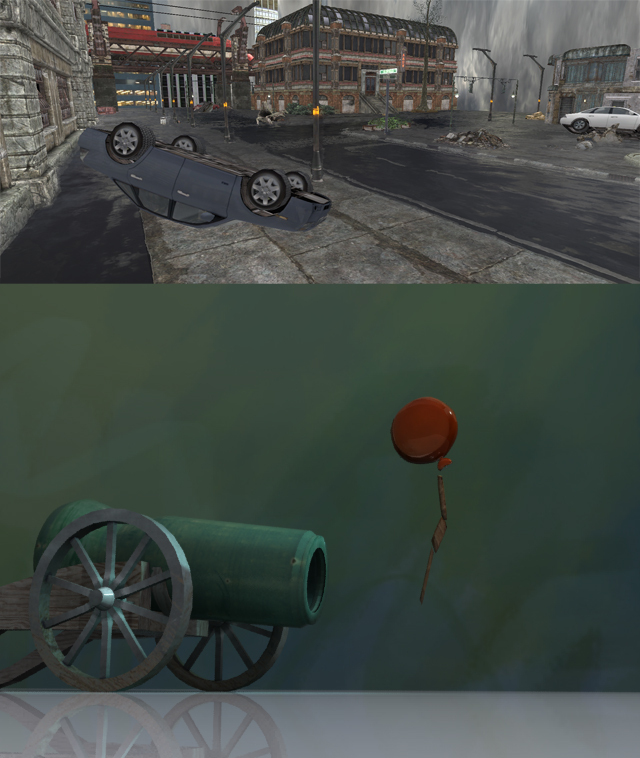 The highlight of this week was finishing the Bouncing Ball animation, of the balloon that has a crush on the cannon. Guess how it turns out. Lots of fun for this one. Learned how to texture and unwrap the cannon right on time for this week’s texturing assignment, played with lighting and rendering, even included a particle effect. Although I have more little details that I wanted to include on my “animation wish list”, I am pleased that I managed to pull off as much as I did. Wasn’t really happy with my Bobo the Demon unwrap and texturing, as I’ve left too many seams in, hence it is not included in the screenshots for this week. Great learning experience though – probably gave me a good glimpse onto how to optimize texture space later on. 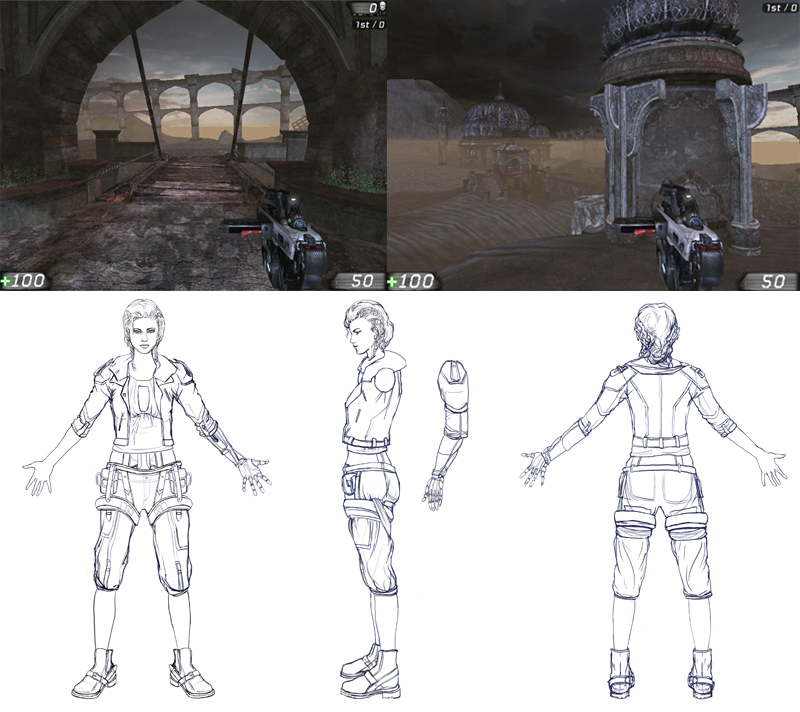 Top Left: Concept sketch for 360 turnaround for UT3 Editor artistic level; Top Right: Skyline assignment in UT3 Editor. Hands modelled in 3DSMax; Bottom Animation with external controllers, bones, and skinning for shark. 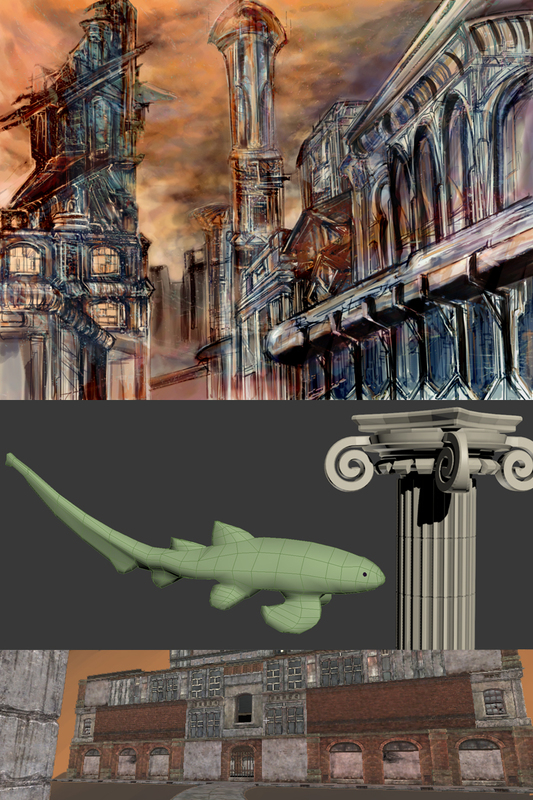 Not shown: For week 5, additional concept sketches, a sell sheet for an original concept of my own game world, and a number of modelling and texturing assignments using instructors’ personal meshes. For week 6: A UT3 terrain, and more modelling/texturing similar to last week’s. Clockwise from Top: 1. 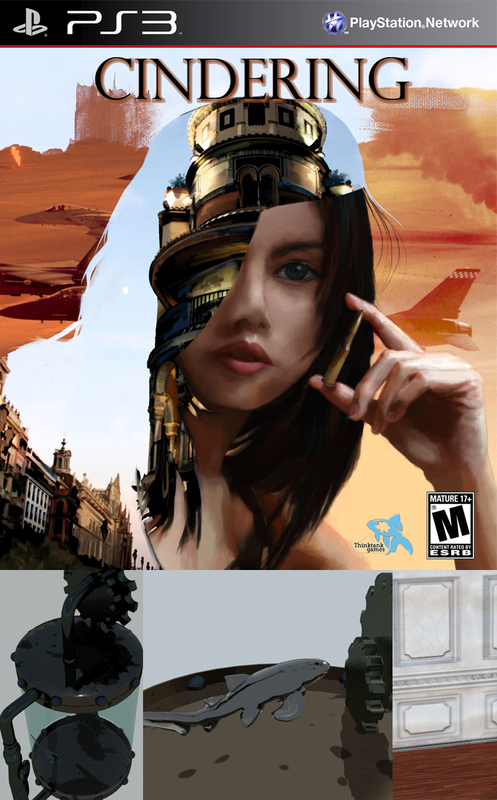 Box art for Cindering, an original game idea; 2. Two animation captures for Shark in Cistern; 3. Normals wall and floor. Not shown: Untextured modelling for wrench, UT3 Editor BSP block out. Returned from reading week to be met with more extensive projects, with milestones every week! I really like this because it comes at a good time when I was hovering between confidence and uncertainty in my newfound 3D skills – To push me to do longer, forward-thinking projects had indeed created the intended effect of confidence through practice. I also really like how there are some classes that share project assets, so I’ll receive different feedback from instructors from a different perspective. It’s really comprehensive and demanding, as a result. By the way, I won’t overlap with posting the same assets here until the final result, but only refer to them in the captions. For “Cindering“, my concept project, I’m armed with a new narrative in mind for my dream game. Basically, you play as a wartime correspondent named Alicia, who gets serious war fatigue, and begins uncovering a secret mythical world that may quell the violence in her current reality. Worlds overlap, hence the visual play of a double exposure. Spent a few days just painting away to reach that level of completion. Also really enjoyed creating my slightly surrealist shark in a giant steampunk-esque cistern. Poor thing hopefully conveys its loneliness within its claustrophobic space well. Finally, we dove into using nDo2, which is a gem. I had quite a bit of fun attempting to make classy but aged panel stone walls and wooden floors. 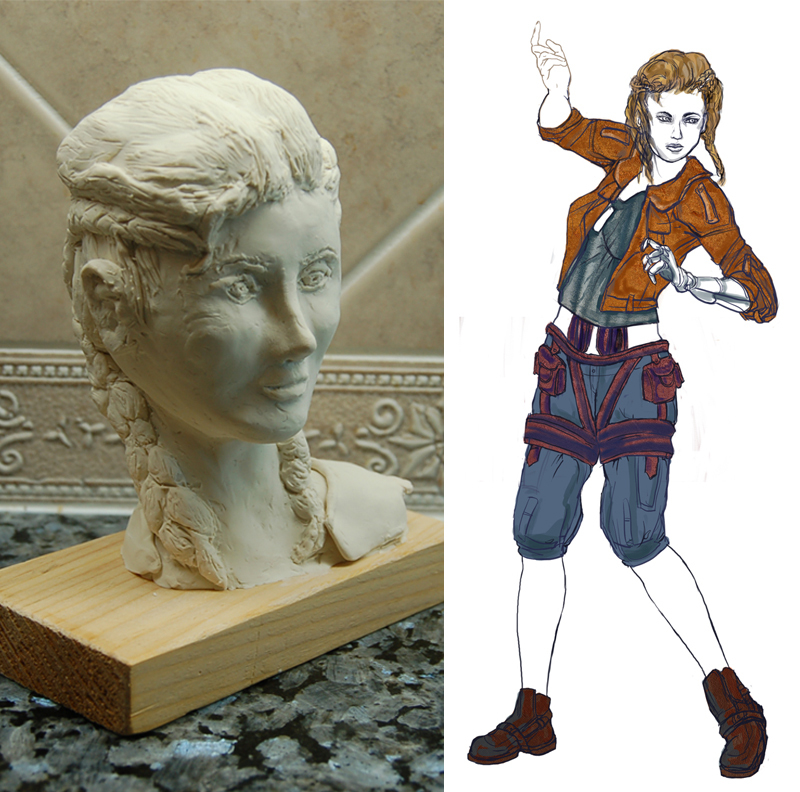 Left: Sculpey clay head bust of original character concept (4″ tall); Right: 3/4 action pose of character. Not shown: CAT rig of dinosaur animation, normal bake of wrench. I haven’t created anything in Sculpey since middle school. Well, let’s just say that I quite miss the symmetry tool when working on this. In hindsight though, it’s really interesting to experience how similar zBrush is to clay – and also how it differs when you get poles in the mesh, for example, where edge loops runs out, or when digital tools either become sharper or blunter than you expect them to. Character concept work is continuing apace, though I had lingered longer in this stage than I ought to have. I took a lot of time trying to decide what sort of outfit a near-future protester, or freedom fighter, would want to wear, and how she’d like to present herself. Though I wasn’t consciously thinking it at the time, there’s lots of La Muse (American comic) influences here. I’ve accumulated a lot of references on leather jackets and boots and women’s tops to suit my character. In terms of baking, I’m already coming across my first errors with shading groups, and had to spend quite a bit of time in the next week to troubleshoot it before jumping into the other texture maps. 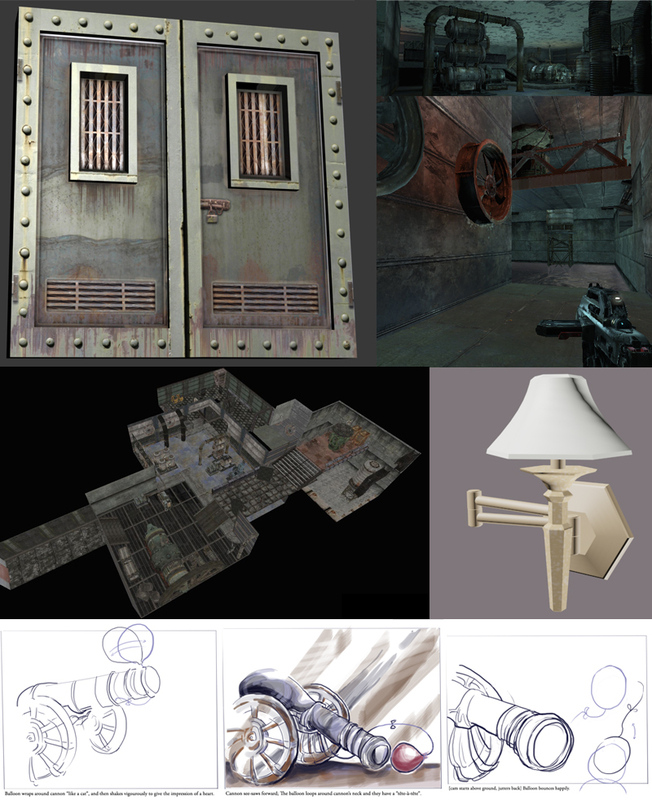 Top: Two screenshots from UT3 Editor’s 360 degrees scene project. Bottom: Turnaround illustrations for character project. 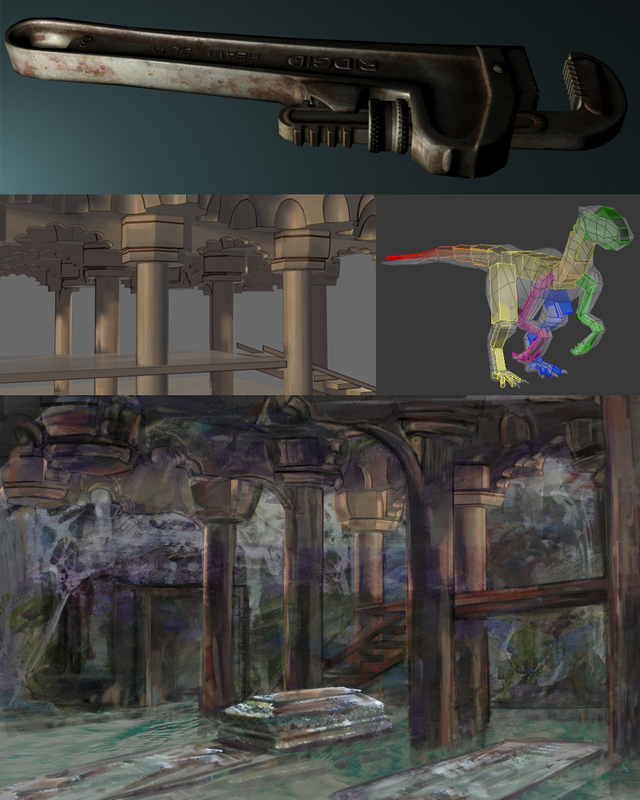 Not shown: Dino animation first pass, untextured low-poly and high-poly of hammer. Both projects seem to take quite a lot more time than initially predicted! The scene project in UT3 closes the chapter on the older Unreal editor. I am more than happy to graduate to the advanced version because most of my interest lies in playing around with materials for individual objects and lighting, both of which are bound to be more extensive in the bigger brother of the two engines. For the character turnarounds, I took an inordinate amount of time trying to figure out in advance what I’d like to model for a long time. In hindsight, I should’ve jumped into 3DS Max with the low poly faster, and not focused so much on the illustrations as the anatomy in 3D is bound to change. I’m quite happy with this illustration, all the same, as my first schematic or turnaround illustration. Clockwise from Top: 1. Texturing of wrench, with normal map bake; 2. Dino rig; 3. 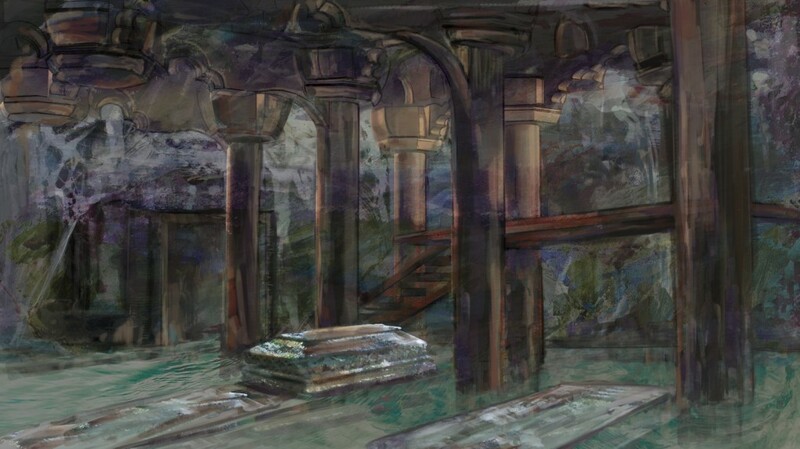 Polished concept art piece for “Cindering” tomb; 4. Matte painting base for “Cindering” tomb. Not shown: Small homework assignments on learning zBrush brushes and exports, lo-poly character. Normal bakes challenges aside, I enjoyed using a number of references in order to put together the wrench textures. I had some more time for this small assignment to really get to know my model and figure out where wear and rust would accumulate on metal surfaces. I also enjoyed putting together some matte-painting style concept art pieces, which I haven’t tried before for any previous assignments. That’s to say, I modelled out the basic architectural structure first in 3DS Max, played with the lighting, before painting over it in Photoshop. 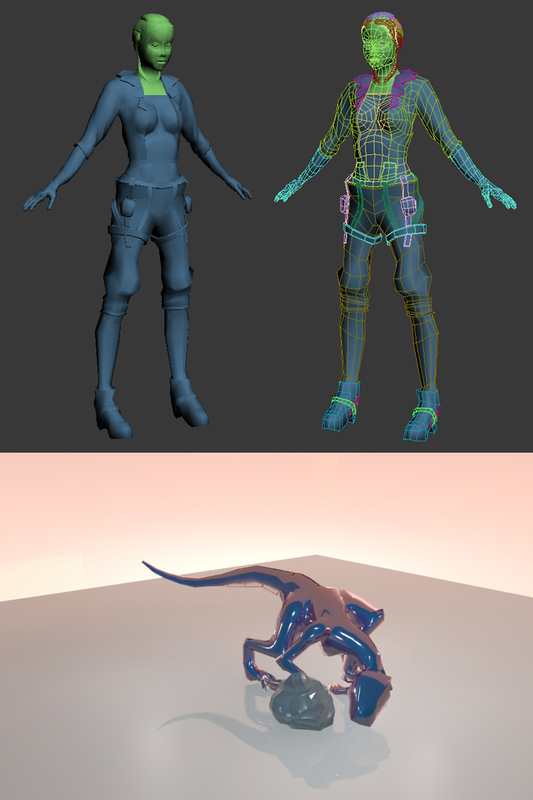 The dino got me acquainted with the CAT rig, which, probably due to practicing similar concepts, felt much more intuitive than the first time I created a bone structure. I was less than enamoured with the low poly construction of my character this week, however..
Top: “Lo-Poly” character mesh at 7226 polygons. Bottom: Final “side-step” animation of Dino. Not shown: Inorganic high poly for robotic arm. I’ve received so much feedback and guidance from classmates and instructors on how to create a solid base character mesh. I did delay going into zBrush, but I’m glad that I took the time to learn how to make the proper edge loops for the body to really manage the polygons by the time I have it for export into Zbrush. The reason that it matters is because Zbrush will multiply every polygon by 4 at every subdivision, thus allowing for more detail such as folds in clothing to be articulated. Subdivide 3 times, for example, and you get 4 to the power of 3 number of polygons from just the one initial poly. By managing my edge loops, I was also more in control of my volumes and being able to adjust and articulate the anatomy of the character. The dino animation was also a very steep learning experience because I had to really work at creating dynamic poses that tell a story. The principles of follow-through action, silhouette and balance are not yet second-nature to me. However, the majority of the class, having had classical animation background, are very willing to offer critique at the project’s submission. My instructor also emphasized weight and balance of the creature, which I hope I can emulate and practice again in later projects. Despite the fitted CAT rig, there’s still so much to keep in mind for every basic action! 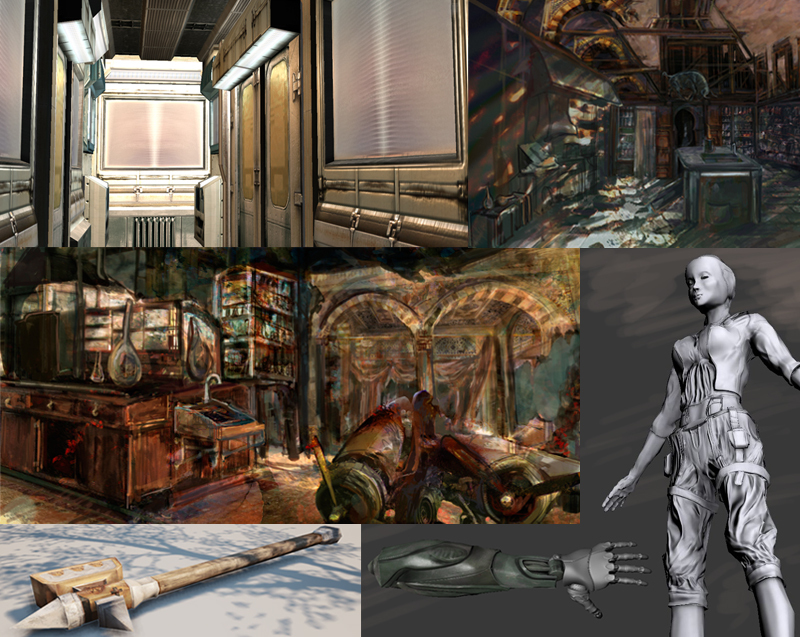 Top Left: Robotic Arm Low and Hi-Poly; Top Right: zBrush process of main character; Bottom Left: Hammer with Diffuse, Spec, Normal and Gloss map; Bottom Right: Character Rig and Pose. Not shown: All the process work leading up to Week 14. Ohh, the robotic arm. Probably the most misguided in ambition that I’ve attempted to create from concept to realization. All other inorganic modelling we’ve done in the past are heavily reliant on a key reference for the majority of the modelling. This particular project suggests that I could stand to model a robotic arm 90% from reference of one prosthetic and the remaining 10% from combining reference photos from other small machinery parts. But no, I did this from anatomical sketches and my own schematic doodles. Great learning experience of my own limitations from beginning to end. The robot arm gave me all sorts of struggles with edge loops, how metal seams actually look, how the low poly should bake out… from this screen capture alone, it should be clear that the original low poly looks nothing like the high poly, as stated in my write-up for Week 14. I didn’t really realize until mid-week 13 that I needed to retopo, and I didn’t realize until three days of the due date exactly how long retopoing in 3DS Max takes. And finally, there’s a first pass on zBrush of the character in its entirety. I started using the move brush on large areas to polish up the anatomy. As a first character, I may have gone a touch overboard with the folds and creases in the pants, making it less cotton-like in weight and more like silk. The belt are starting to become mushy, which needed some polishing up over Week 14. Week 12’s hammer texture took quite some time with both high poly bakes in 3DS Max and ornamental detailing in nG02. Had some fun trying out coloured spec to differentiate the copper from the iron, and gloss to create a separation of all different materials. I actually like more how the textures turned out in realtime UDK rather than in the Xoliul Shader, the work of which is described in Week 14. The intense amount of workload that I have done – indeed, close to double of the time spent as compared to my undergraduate years – really engendered me to examine my decisions quickly and to live by it. It’s actually quite thrilling to experiment with new art tools and just love the learning process. I know that the outcome might not always be top-quality this early on in the learning stage, especially when I decide to be more ambitious and take myself out of my comfort zone, but I honestly learn so much from stumbling and having to troubleshoot the issues that arise. Baking, for example, has been a constant stumbling block for me since I’ve learned about it, but somehow I’ve summoned enthusiasm for trying to improve my outcome for it. And, I’m surprised at myself and my rallying spirits, which just makes me feel more positive about everything. It’s like this cyclical feeling of good vibes. I want to keep being clear-headed about my goals and what I must work on to reach it, while keeping myself open to diverse ideas. That’s how I started into Game Arts, and that’s how I intend to thrive. I think that, even though many pieces from the last four months lack polish, they nonetheless generate new ideas. Keep ’em coming, I say. 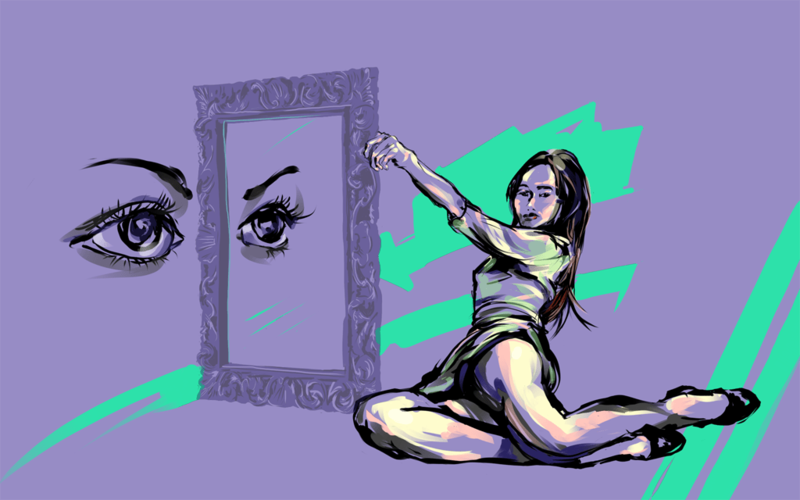 This is part of a series of illustrations for the mini-project ‘Narcissus’ that I am going to produce. There’s a number of styles and techniques that are utterly new to me with this little project, so I’ll try to enumerate many of these details. First of all, it was the first time that I’m learning to use Autodesk’s Sketchbook Pro. The workflow is highly intuitive, which certainly helps, because I believe that if it was another CGI painting program, I may take an even longer time to produce a piece like this. From concept to the final product, I used Sketchbook; I have had made no other sketches to help ferment this idea. 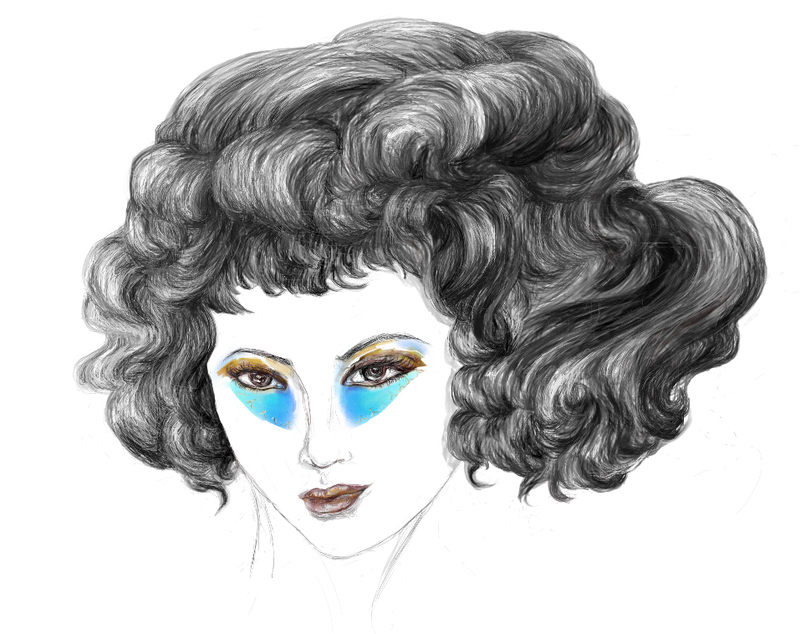 Second, I was actively aiming to go with a different visual style: To translate my style of colourful realism to something that is more like a fashion editorial illustration. 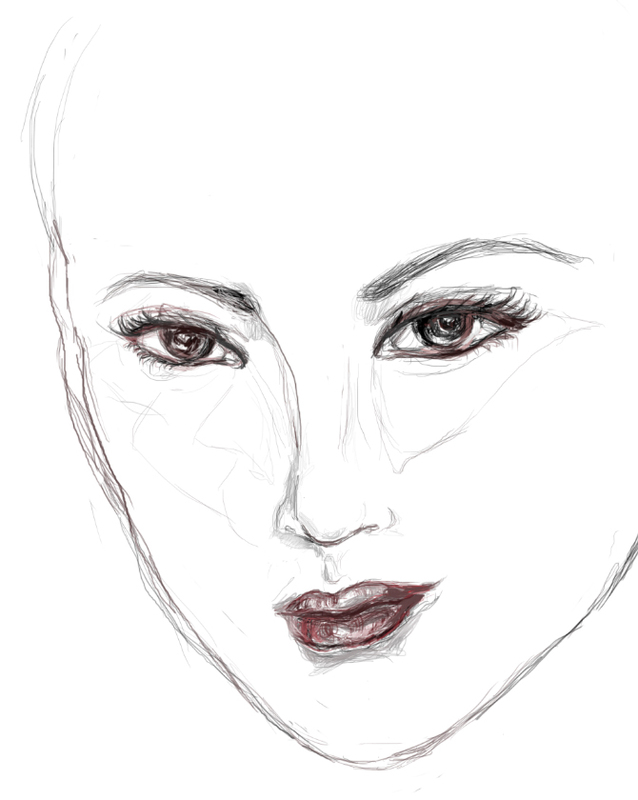 I went with a monochromatic drawing with bold, curvy shapes and used colour only on the eyes and lips to make them pop. I had a hard time at first because her facial structure is still fairly fleshed out like a realistic figure, although her eyes are scaled larger. I scaled back her chin to make the proportions look more otherworldly. In order to try to achieve a more fashion editorial look, I completely restricted myself from using any sources. 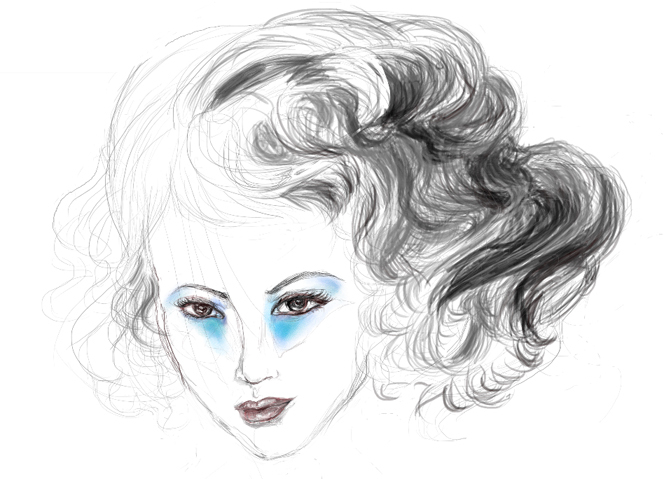 I had an idea in mind – big curls and these daring, neon eyes – and I started playing with shapes. 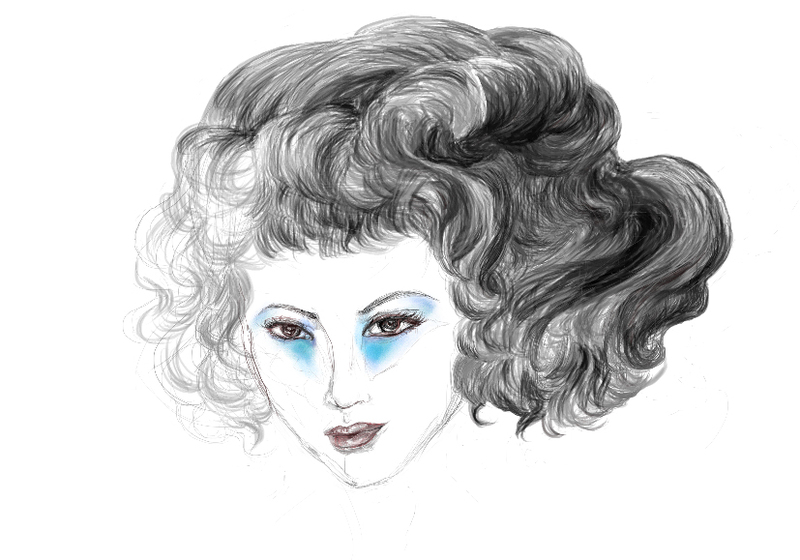 After about 4 tries of getting the hairdo just right, I started in on different values. From the lines going across her right eye in the previous drawing, I had realized that her forehead was too high, almost as though the hair was floating above her head. Started developing some wispy bangs that were much smaller than the bouncy curls, kind of like the smaller, non-flight feathers of a bird. 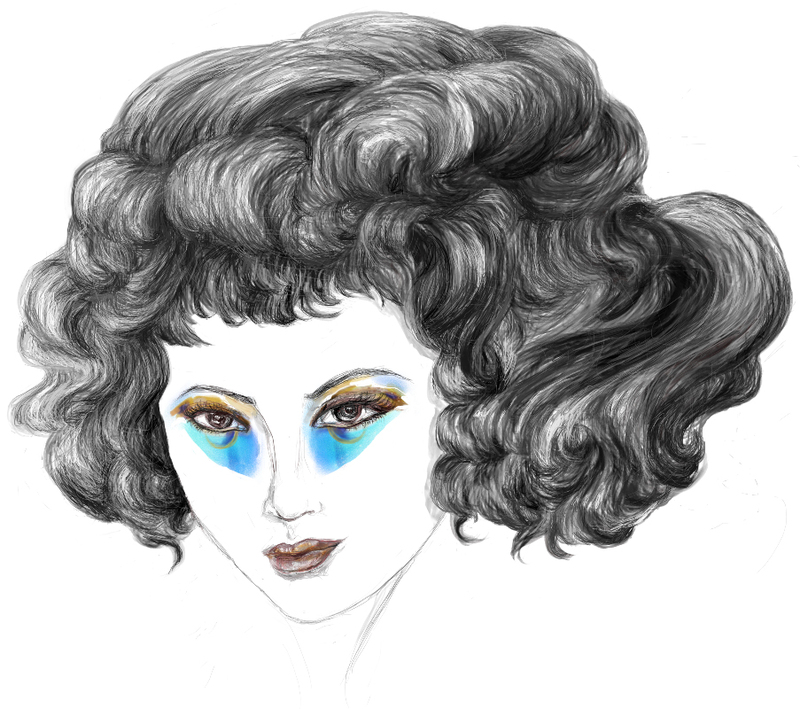 I knew that, much beyond the dramatic hair, I had wanted to go with avant-garde make-up from the beginning. This was something that I haven’t ever explored before. The reasons behind this might become more apparent when I create more pieces for the ‘Narcissus’ series. I must’ve struggled two hours with the proper “look” of the make-up, so that I am not merely making pretty dark shadows with the blue in the previous process shot. I did this Mardi-Gras decor first, then had my six hours sleep, woke up and played with a more edgy, Eye of Horus inspiration. Finally, I have found the dark, fantastical couture that I was aiming to achieve. Note: If the animation doesn’t start right away, left-click on the image area above. Something I dubbed “Cicatrix” was evoked at the end of the rotoscope. This was a short story that I started writing in grade 10 about the speculative near future, where there were tribal groups vying to advance technology for their own clan. This triggered a genetic mutation that killed off 10% of the population and caused an increase in stillbirths. This decimation is the “IX” in “Cicatrix”. The tribal societies became increasingly xenophobic and reverted back to a feudalistic structure to suppress the population from forms of revolt. The story of Cicatrix is told through the eyes of a girl who dared to travel to document the strange dreams that have been developing over the surviving citizen population, and comes to learn how this uncovers the mystery of those who died. Because I wrote this a while ago, I would say that it is aimed at a YA audience. Perhaps I’ll refine the story one day. The email address mentioned at the end doesn’t exist anymore, but it’s nice to know that I was thinking of how I could pitch the project, even then. The animated character was based off of a video of my acting. Click here to see a test rotoscope that I did for practice, before embarking on this particular project. All of these were hand-drawn in Flash.